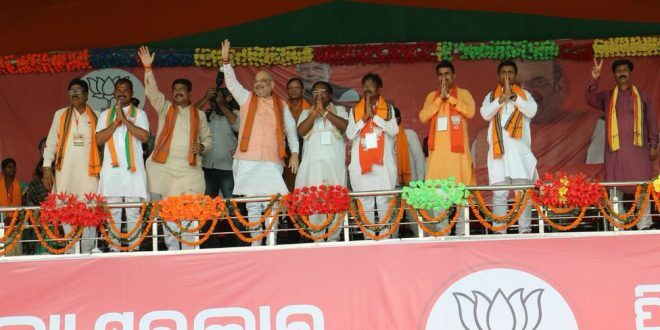 Bhubaneswar: BJP National President Amit Shah on Monday appealed the people to give the party a chance to form a government in Odisha. He assured that the party will bring development in Odisha. “I urge people of Odisha not to repeat the mistake by electing BJD once again. You have given 19 years to BJD and Congress for a long period. Give a chance to BJP, we will make Odisha number one state in five years,” said Shah in Paralakhemundi of Gajapati district. He said the state government is so much dipped in corruption that it did not even spare Ratna Bhandar of Lord Jagannath. Shah said it is unfortunate for the people of Odisha that Naveen Babu can’t speak Odia without reading that even after 19 years of his rule in the state. “Elect a Chief Minister who will understand your language, feelings and emotions. How can someone who doesn’t know Odia solve the problems of Odia people?” asked Shah.